Winter time means one thing, dry air, lots and lots of dry air. The dry air of winter causes all kinds of unpleasant side effects: chapped, itchy and cracked skin, then there’s the dry, scratchy nose and throat and don’t forget about all of the extra static electricity in the air. Well, don’t stand for the discomfort that comes with the dry air of winter any longer. Consider adding a humidifier to your home for an unbelievable level of comfort this winter. A Flow-through Humidifier is the best way to bring moist air back into your home. With the proper level of humidity in your home, you will feel more comfortable and breathe easier. You can eliminate that dry eye, nose and throat feeling you have when you wake up in the morning. Humidity also reduces or eliminates static electricity. Additionally, it protects the investment in your home and your furnit ure because proper humidity prevents the wood from cracking and peeling. A flow-through humidifier can be easily added to any forced air heating system. 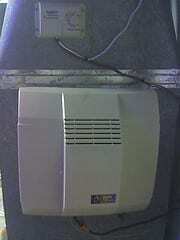 The advantage with this type of humidifier is that it provides humidity without breeding or spreading mold or mildew. This is in contrast to the humidifiers that use a reservoir where water can stagnate creating a perfect environment for mold and mildew growth. A flow-through humidifier is easy to maintain. It has no moving parts and is designed to operate with no mineral or mold buildup. Contact us today to have one of our technical experts install one of these amazing flow-through humidifiers in your home. You’ll breathe easier, save money on moisturizing products and won’t have to live in fear of static shock every time you touch something.